Background: A custom jawline implant is the single most powerful procedure I have seen in facial reshaping surgery for many patients. Expanding the inferolateral bony contours of the lower jaw around its entire surface predictably creates a change in the shape of one’s face that creates a visible difference in the face-neck transition. 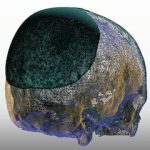 Custom jawline implants are specifically made for each patient off of their 3D CT scan. While computer designing gives the optimal chance for a successful aesthetic outcome, there is no assurance that it will create the desired aesthetic result in any given patient. Besides a patient experiencing a ‘new face’ from implant placement and the unpredictability of this psychological impact, the computer nor the surgeon can know exactly how to give any patient their ideal outcome. 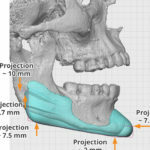 The implant’s dimensions are ultimately a judgment call in the design process. As a result of how the look of the custom jawline implant will be interpreted, revision of such implants are not rare. Patients may ultimately determine that the implant is too small or too big and seek a new replacement. In doing so such new designs must take into account encapsulation of the existing implant and challenges that may arise in its placement and orientation on the bone. Case Study: This young male had a prior custom jawline implant placed that he ultimately determined was too big. The dimensions of the existing implant were by his own design which unfortunately turned out to be excessive. The jaw angles were too wide and positioned too far back and the chin was also too wide. A new custom jawline implant was design that corrected this over sizing. 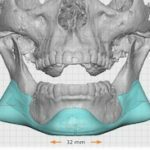 Knowing that the new jaw angles portions of the implants were still ‘big’ and that encapsulation of the existing larger jaw angle implant portions would be tight, the new custom jawline implant incorporated an internal wedge design. This would enable them to be folded and inserted with less difficulty. Under general anesthesia and through his existing submental skin and intraoral mucosal incisions, his existing jawline implant was removed with difficulty. It was so severely scarred in that it had to be cut up into numerous pieces for its removal. 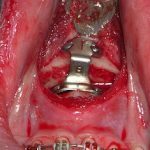 The new custom jawline implant was able to be placed in a back to front technique using a geometric midline splint technique combined with the fold over of the jaw angle internal wedge design. Large custom jawline implants require innovations in their design for surgical placement. While their size may look impressive on the facial skeleton, such larger implants can be successfully placed through a combination of innovative implant designs and careful surgical technique. 1) Despite the success of custom jawline implants for many patients, some may require either increasing or downsizing their implant secondarily. 3) Accounting for larger jaw angle shapes important in their primary or secondary placement.